I am going to share with you one of the biggest lessons in parenting. I thought I was the most carefree father in the world until I found myself being too protective over J and K.
Every bicycle for children comes with training wheels. I think the inventor’s intention was good. That is to help children to learn how to ride a bicycle more easily. However from my recent experience, this is NOT the case. In fact, the training wheels did not help J and K at all. In contrast with what I thought, training wheels HINDER children from learning to ride. We bought a small bike for J and K for more than a year ago. I always encourage them to get physical and ride the bicycle. For some reason, they were not motivated to pedal. After using the bike for a few times, the bicycle was left to rot in the compound. Those were the days with training wheels on. Recently my wife suggested the kids to learn cycling again. And this time was different. It’s without training wheels. After some convincing, both J and K agreed to give it a try. Last Wednesday, I sent the bicycle to the shop to get the training wheels removed and replaced with a stand. Immediately after that K asked me to send him to a basketball court to learn cycling. Not wanting to let him down and while his eagerness to learn was still strong, I agreed to send him there. At first I was not sure how to teach him. I just did it with trial and error. On the first try, I slightly held onto K and after he gained momentum and the bicycle was moving, I let go slowly. To my surprise, he was able to cycle quite a distance during the first attempt. K had no problems keeping the bike in balance and he could even make turnings. That’s quite an improvement for a young boy who used to cycle with training wheels and learning for the first time to cycle without them. Needless to say, not only the daddy was happy but K was excited as well. As you can see, removing training wheels from your child’s bicycle is the best thing to do. At least he has one less thing to rely upon which he has to learn to “un-use” later. Think this is interesting? That’s only half of the story. There’s more to it. Let’s talk about J now. Since J had no time to learn cycling on weekdays, her first lesson of cycling was on last Saturday evening. I used the same method I used to teach K on her. After a good 30 minutes, I failed to see the same kind of result I got from K in J.
J not only couldn’t cycle constantly and smoothly but she seemed to have problems balancing the bike. My patience started to run low. So did hers. She cried and wanted to give up. I tried to motivate and psych her up like a boxing coach. This was when my wife chipped in and suggested to let J cycle on her own – without handholding, literally. I have to give credit to my wife. She was spot on. When J was left alone learning, she slowly gained confidence and found her way to balance the bike herself. She “got it” faster when I did not hold her. She learned faster when I let her on her own. In hindsight, I thought I was doing her a favor by holding her while she learned cycling. But in fact, I did a disservice to her. Handholding could be the very reason she couldn’t get the hang of cycling and balancing. Sooner than I thought, the moment we left her to learn on her own, she made it. J was extremely excited because she didn’t expect she could learn cycling in one evening. K knew how to cycle when he’s on the move. But he still had a problem on starting to cycle on his own. We used the same approach (without handholding) on K. In just a few rounds, he had learned to start cycling the bike with no pushing from me. Another proof that no handholding worked. From the cycling experiences of J and K, we can see that letting go and giving ample learning space to children are critical to speed up learning. Let’s summarize. 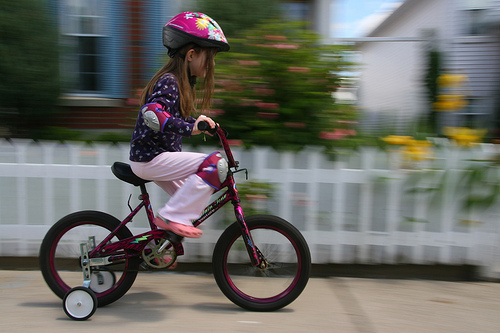 To speed up learning, the first step is to remove the training wheels (K commented after succeeding to ride a bicycle that a bike without training wheels is so much better, faster, and fun!) Secondly, parents must be “brave” enough to let the child to be on his own accord when he learns something. Thinking that we should be there to support him is entirely a myth. The story serves not only as a guide to the fastest way to teach children to cycle, but it also can be extended to show parents the best principle behind learning. That is to let the kids explore and making mistakes without interference from adults. That’s the holy grail of learning. Now, if you don’t mind, I have a task to do: Throw away the training wheels. Note: I’ll be launching my new book “The Uncensored Guide to Parenting” soon. One of the main principles in the book is to create independence in children. To get notified when the book is ready, join the notification list.